On 28 July 1866, the 39th Congress of the United States passed an act to improve the peace establishment of the nation. This act authorized the formation of additional regiments in the US Army, 2 cavalry and 4 infantry. For the first time in the nation’s history, these Regular Army regiments were to consist of black enlisted Soldiers. The 9th Cavalry was organized on 21 September 1866 at Greenville, Louisiana, a town near New Orleans. Colonel Edward Hatch, a Veteran cavalryman and former general officer in the recently concluded Civil War, was selected to be the Regiment’s first commander. The 9th Cavalry, along with its sister regiment, the 10th Cavalry, became known as the “Buffalo Soldier” regiments; a title of respect bestowed by the Indians they fought. The 4th Squadron, 9th Cavalry Regiment traces its lineage to the formation of Company D, 9th Cavalry Regiment and the 6th Squadron, 9th Cavalry traces its lineage to Company F.
In the 1870s and the 1880s, the 9th Cavalry fought with great distinction throughout the western United States in numerous campaigns against marauding American Indians, Mexicans, and lawless settlers. The 9th Cavalry was often the only source of security on the frontier and was often at odds with those who would profit from banditry. While most of the 9th Cavalry’s actions were against hostile Indians, in 1884 the regiment also protected the friendly Indian tribes settled in present-day Oklahoma from settlers seeking to steal their land. From these early campaigns, the 9th Cavalry derived a part of its unit insignia: an Indian in breach cloth mounted on a galloping pony and brandishing a rifle in one hand. The 9th Cavalry Troopers earned fifteen Medals of Honor during the Indian Wars. Most of these medals were earned by noncommissioned officers leading small detachments of Soldiers. The regiment participated in campaigns against the Comanche, Utes, Sioux, and Apaches. Two months after the battleship Maine sank in Cuban waters, the Regiment, then stationed at Fort Robinson, Nebraska, was alerted for deployment to war. The Regiment departed four days later on 60 rail cars destined for Florida to stage for invasion. One of the first units to go ashore, it fought as dismounted infantry alongside Theodore Roosevelt’s Roughriders in the gallant charge up Kettle Hill and San Juan Heights. The Regiment’s commanding officer, Colonel Hamilton, was killed in action during the attack. It was there that the Regiment derived the rest of its insignia: the 5 bastioned fort patch of the V Corps, to which the 9th Cavalry was assigned. After the fighting ended in Cuba, the regiment was sent to another trouble spot, the Philippines. During the Philippine Insurrection, the 9th Cavalry continued its hard fighting tradition by conducting 3 successful deployments to the Philippines from 1900 to 1916 to fight the rebellious Moro tribesmen and earned the respect of the military governor, General Arthur MacArthur. While most of the Regiment was deployed to the Philippines, several troops remained stationed at the Presidio of San Francisco. In 1903, these troops served as a Guard of Honor to President Theodore Roosevelt. This was the first time black regular cavalrymen served in this capacity. During the 1920s and the 1930s, the Regiment patrolled the Mexican border and was assigned to the 3rd Cavalry Division on 1 March 1933. The Regiment was called upon again during World War II. On 10 October 1940, the 9th Cavalry was reassigned to the 2nd Cavalry Division and prepared for overseas deployment. The Regiment trained in the Arkansas Maneuver Area from August to October 1941 then returned to Fort Riley, Kansas. Due to overcrowding at Fort Riley, the Regiment transferred to Fort Clark, Texas in July 1942 where it continued training for combat in Europe. The War Department decided a second cavalry division unnecessary for victory and directed the 2nd Cavalry Division deploy to the Mediterranean theater and inactivate to provide replacements to critical logistical organizations. Accordingly, the Regiment dismounted, embarked at Hampton Roads, Virginia on 31 January 1944, arrived in North Africa on 9 February 1944, and was inactivated on 7 March 1944 at Assi-Ben Okba, Algeria. The Regiment’s Soldiers were transferred to support units. The 1st Battalion, 9th Cavalry shares the heritage of the 302nd Reconnaissance Troop (Mechanized), with which it was later consolidated. The 302nd Reconnaissance Troop was activated on 4 December 1943 in Australia and assigned to the 1st Cavalry Division. The 302nd participated in the New Guinea, Bismark Archipelago, Leyte, and Luzon campaigns. On 20 October 1950, the Regiment was redesignated the 509th Tank Battalion. 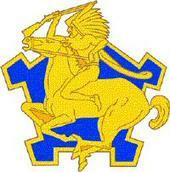 The Battalion was activated on 1 November 1950, at Camp Polk, Louisiana, and reassigned to the 1st Cavalry Division. At the time the 1st Cavalry Division was in battle with the Republic of Korea. The 509th Tank Battalion arrived in Korea in time for the historic defense of Pusan and fought in numerous campaigns throughout the war, earning distinction and honor in the fight against North Korean and Chinese aggression. In December 1952, the Battalion became one of the early units to racially integrate. After the war, the Battalion patrolled the DMZ until 10 April 1956, when it was transferred back to Fort Knox Kentucky and inactivated. On 1 November 1957, Troop A, 9th Cavalry was reorganized and redesignated as Headquarters and Headquarters Troop, 1st Squadron, 9th Cavalry, with its organic elements concurrently constituted and activated. The Squadron was activated in Korea and reassigned to the 1st Cavalry Division where it conducted reconnaissance missions along the DMZ. The Squadron was transferred from Korea to Fort Benning, Georgia on 1 July 1965 and reorganized as part of the reflagging of the 11th Air Assault Division (Test) as the 1st Cavalry Division (Airmobile). On 15 September 1965, the 1st Squadron, 9th Cavalry arrived in the Republic of Vietnam and began operations as the divisional air cavalry squadron for the 1st Cavalry Division (Airmobile). The 1st Squadron, 9th Cavalry participated in such pivotal battles as the Ia Drang Valley, Khe Sahn, Binh Dinh, and Quang Tri. The Squadron was the first unit of the 1st Cavalry Division to capture North Vietnamese Soldiers with C Troop taking three prisoners on 30 October near Pleiku. The 1st Squadron, 9th Cavalry remained in Vietnam until 28 June 1971. During their time in Vietnam, elements of the 1st Squadron, 9th Cavalry earned 14 campaign streamers, 3 Presidential Unit Citations, 5 Valorous Unit Citations, and the reputation as one of the finest combat units in Vietnam. It is estimated that the 1st Squadron, 9th Cavalry was responsible for 50 percent of all enemy Soldiers killed by the 1st Cavalry Division during the war. It was for this reason that the Squadron earned the nickname “The Headhunters.” Three Troopers of the 1st Squadron, 9th Cavalry earned the Medal of Honor in Vietnam. 1LT Robert L. Poxon, B Troop, was awarded the Medal of Honor posthumously for his actions on 2 June 1969, in the Tay Ninh Province; SGT Donald S. Skidgel, D Troop, was awarded the Medal of Honor posthumously for actions near Bong Son, Vietnam on 14 September 1969; and CPT Jon E. Swanson, B Troop, was awarded the Medal of Honor posthumously for his actions in the Kingdom of Cambodia on 26 February 1971. LTC John B. Stockton, commander of the 3rd Battalion, 17th Cavalry Regiment, is given credit for establishing the tradition of wearing the Cavalry Stetson, much to the chagrin of the Division command group. By the time the 11th Air Assault Division was redesignated the 1st Cavalry Division (Airmobile) the members of his unit, the 1st Squadron, 9th Cavalry Regiment, were wearing the hat. LTC Stockton transferred the “Cav Hat” tradition to the 1st Cavalry Division in Vietnam. By the end of the Vietnam War, many air and ground units were wearing the hat. The tradition was continued after Vietnam and has become the standard for all cavalry units in the Army. Hollywood honored the Squadron in its fictional portrayal of an attack on a communist base camp in the film Apocalypse Now. During the Squadron’s time in Vietnam it was 100 percent mobile with organic transport, which included nearly 100 helicopters. The unit had three air cavalry troops, and each troop had an aero scout platoon, an aero weapons platoon, and an aero rifle platoon. The mission of the aero scout platoon was to find the enemy. Until 1968, these platoons used OH-13 observation helicopters but by mid-1968 those ships were replaced by the faster, more maneuverable OH-6A Light Observation Helicopter (LOH). The scouts would skim low over the terrain searching for any sign of enemy movement or activity. The scouts were referred to as the “White” platoon. The aero weapons, or “Red” platoon, were initially made up of UH-1B (Huey) gunships until they were replaced by the AH-1G Cobra gunships in 1968. Armed with rockets, miniguns, and grenade launchers the “Red” gunships joined with the “White” scout ships to form the “Pink” team which made up the basic working unit of the squadron in Vietnam. The aero rifle platoon (Blues) complemented the aerial reconnaissance capabilities of the “Pink Team by providing ground reconnaissance. Transported by Huey slicks the Blues could be quickly inserted to check sightings by the aerial observer, assess the damage inflicted by the gunships, and pursue the enemy. The Squadron’s fourth troop, Delta Troop, was a ground cavalry unit with three platoons mounted on wheeled vehicles. After Vietnam, the Squadron returned to Fort Hood, Texas with the rest of the 1st Cavalry Division and served as divisional recon squadron until 16 October 1986, when it was inactivated. On 25 November, 1992, the 1st Squadron, 9th Cavalry was reactivated, reorganized as a mechanized infantry battalion, redesignated as the 1st Battalion, 9th Cavalry and assigned to the 1st Cavalry Division as part of the 3rd Brigade. The Battalion continued to be called upon for hard missions and completed deployments to the Emirate of Kuwait for Exercise Intrinsic Action and highly successful National Training Center rotations in July 1993, January 1996, and December 1997. Troop D, 9th Cavalry was reconstituted, reorganized, and redesignated on 19 March 1969 as Headquarters and Headquarters Troop, 4th Squadron, 9th Cavalry, and was subsequently reactivated. Its organic elements were concurrently constituted and activated. On 16 March 1987, the 4th Squadron, 9th Cavalry was moved to Fort Lewis, Washington, and was assigned to the 9th Infantry Division (Motorized) as the divisional reconnaissance squadron. In 1991 the squadron was inactivated along with the rest of the 9th Infantry Division. On 1 December 1957 F Troop, 9th Cavalry was reconstituted in the Regular Army as Headquarters and Headquarters Troop, 6th Reconnaissance Squadron, 9th Cavalry. It was redesignated on 30 June 1971 as Troop F, 9th Cavalry, assigned to the 1st Cavalry Division, and activated in Vietnam. Troop F, 9th Cavalry became the brigade reconnaissance troop for 3rd Brigade, 1st Cavalry Division on 20 April 1999. This activation was part of the transformation of the 1st Cavalry Division to the US Army’s Force XXI force structure. Between 2001 and 2004, the unit deployed with 3rd Brigade, 1st Cavalry Division in support of both Operation Enduring Freedom and Operation Iraqi Freedom. On 20 September 2002, as part of the US Army’s Force XXI force structure, Headquarters and Headquarters Troop, 4th Squadron, 9th Cavalry was reorganized and redesignated as D Troop, 9th Cavalry, reactivated and assigned to 2nd Brigade, 1st Cavalry Division. There it served as the Brigade’s reconnaissance troop. The troop deployed with elements of the 2nd Brigade, 1st Cavalry Division to both Operation Enduring Freedom and Operation Iraqi Freedom between 2001 and 2004. The Headhunters of the 1st Battalion, 9th Cavalry Regiment began deployment to Iraq in September 2003 in support of Operation Iraqi Freedom, arriving there in early 2004. There they operated in a very complex environment, assisting Iraqi institutions (Neighborhood councils, Iraqi National Guard, Iraqi police, etc), and facilitating quality of life improvements for the Iraqi people. During the deployment, Task Force 1-9th Cavalry Soldiers operated in one of the most dangerous sections of the Iraqi capital, including Sadr City. Two companies from 1-9th Cavalry were working with other Task Forces. Task Force 1-9th Cavalry consisted of C/1-9th Cavalry, HHC/1-9th Cavalry, C/1-153rd Infantry (from the Arkansas NG), A/8th Engineer Battalion, A/215th Forward Support Battalion, along with a PSYOPs and a Civil Affairs Team (both Army reserve units out of Florida and Texas respectfully). Task Force 1-9th Cavalry was located in downtown Baghdad, subordinate to 3rd Brigade, 1st Cavalry Division. Their area contained slums and lower to upper class neighborhoods. The dense urban terrain meant that the Headhunters had to do a whole lot of dismounted patrolling. The Task Force had been engaged in numerous combat actions. These included reacting to enemy ambushes, hasty attacks on enemy ambush positions, and numerous cordon and search operations to capture terrorists, insurgents, and gangsters. The enemy had employed Improvised Explosive devices, RPGs, mortar fire, small arms, and hand grenades against patrols. Task Force 1-9th Cavalry Soldiers did very well against these attacks due to their high level of training, protective equipment, and courage under fire. Unfortunately, Task Force 1-9th Cavalry suffered some casualties while conducting the mission. By early July 2004, there were over 30 Soldiers wounded and 2 killed. Specialist Miranda (from C/1-153rd Infantry) was killed on 19 May 2004 by an IED in a small alley. It also seriously injured 3 others, Specialist Crawford, Specialist Kuykendall, and Specialist Phillips (all 3 were evacuated to the United States). Specialist Pannell (also from C/1-153rd Infantry) was severely injured during a hand grenade attack and was also evacuated to the United States. He and Specialist Phillips went to Walter Reed to recover. Specialist Heines (from C/1-9th Cavalry) was killed when an RPG struck his HMMWV during a night engagement with insurgents. The rest of the wounded were able to return to duty within a few days. To improve quality of life and make contact with the locals, Task Force 1-9th Cavalry conducted patrols to assess essential services in the city, electricity, water, sewage, and trash removal. The Soldiers used these patrols to develop positive relationships with the people and see how they could help them. They also made sure the Iraqi civilians got to hear our side of the story. If the Iraqis were capable of seeing that the US Soldiers were genuine in their desire to help them, they would have dropped their support for insurgents, or even better, started providing more information to the coalition. As part of the Army’s transformation towards a modular force, the 1st Battalion, 9th Cavalry was inactivated and relieved from assignment to the 1st Cavalry Division on 14 July 2005 at Fort Hood. It was reorganized and redesignated as the 1st Squadron, 9th Cavalry and was reactivated on 18 October 2005 as the organic cavalry squadron assigned to the 4th Brigade Combat Team, 1st Cavalry Division at Fort Bliss, Texas. Additionally, the 4th Squadron, 9th Cavalry Regiment was activated and assigned to the 2nd Brigade Combat Team and the 6th Squadron, 9th Cavalry Regiment was activated and assigned to the 3rd Brigade Combat Team. In October 2006, the 1st Squadron, 9th Cavalry Regiment conducted their second deployment to Iraq out of Fort Bliss, Texas, and were detached from the 4th Brigade Combat Team, 1st Cavalry Division and attached to elements of the 25th Infantry Division. Upon returning from that deployment, the 4th Brigade Combat Team, 1st Cavalry Division was inactivated at Fort Bliss, Texas and its personnel reflagged as the 4th Brigade Combat Team, 1st Armored Division. The 4th Brigade Combat Team, 4th Infantry Division was inactivated and reflagged as the 4th Brigade Combat Team, 1st Cavalry Division, which, along with 1-9th Cavalry, was subsequently reactivated at Fort Hood, Texas. During Operation Iraqi Freedom 06-08, the 4th Squadron, 9th Cavalry Regiment “Darkhorse” deployed with Black Jack to Baghdad, Iraq, where it secured the International Zone; the area of central Baghdad that is home to the U.S. Embassy, Iraqi Council of Representatives, and numerous other Iraqi and Coalition governmental offices. The squadron’s responsibilities were later expanded to conduct counterinsurgency operations throughout the Karkh District. The 6th Squadron, 9th Cavalry Regiment deployed to support Operation Iraqi Freedom 06-08 in 2007 along with the rest of the 3rd Brigade Combat Team which was responsible for the Diyala Province and the capital city of Baqubah and conducted operations in the Sala ah Din Province. From June 2008 until June 2009, 1-9th Cavalry deployed in support of Operation Iraqi Freedom 08-10. Operating initially in Southern Babil Province, the Squadron changed missions after deploying and was tasked with disrupting lethal smuggling from Iran to Iraq in the Maysan Province. Alongside the Iraqi Border Guards, the Squadron helped to secure 251 kilometers of border with Iran. The Head Hunter’s efforts significantly disrupted enemy smuggling and helped reduce attacks on coalition Soldiers across Iraq. In December of 2008 the 6-9th Cavalry again deployed with the “Grey Wolf” Brigade, this time to the Nenewa Province in northern Iraq. The 3rd BCT conducted full-spectrum operations to neutralize elements and to improve security, stimulate economic growth, and create enduring stability. In 2009 the 4th Squadron, 9th Cavalry again deployed to Iraq, this time to Kirkuk Province for OIF 09-10, where it was responsible for the security, stability, and reconstruction of the Daquq district and the Taza, Laylan, and Rashaad sub-districts. The squadronpartnered with the 15th Iraqi Army Brigade and Iraqi police from each of its districts to conduct area security and stability operations for an operating environment of over 3,000 square kilometers. The squadron also helped to balance ethnic tensions through the training and equipping Iraqi security forces, improvement of essential services, and the support and promotion of the legitimate government. In 2011 the 4-9th Cavalry deployed a third time to Iraq, in support of Operation New Dawn and also deployed with the 2nd BCT to Afghanistan 0m 2013 to support Operation Enduring Freedom. Redesignated as 1st Battalion, 9th Cavalry Regiment and reorganized as a combined arms battalion the 1-9th Cavalry was relieved of its assignment to the 4th Brigade Combat Team which was inactive and assigned to the 2nd Brigade Combat Team on 17 October 2013. The Headhunters deployed to Korea for a nine-month deployment along with the rest of the 2nd Brigade Combat Team in 2015. Today the 9th Cavalry Regiment is represented by the 1st Battalion, 9th Cavalry which is a combined arms battalion and assigned to the 2nd Brigade Combat Team; and two Armored Reconnaissance Squadrons, the 4th Squadron assigned to the 2nd BCT and the 6th Squadron assigned to the 3rd BCT.